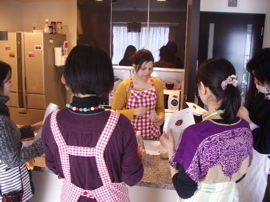 Niki’s Kitchen is a great opportunity to make Japanese friends. About a month and a half has passed since a big earthquake hit Japan. Many foreigners left Japan to avoid aftershocks and radiation, but many foreigners still stay here without hesitation. Cooking instructors of Niki’s Kitchen are the same. They were obliged to cancel their classes due to the earthquake, but some have been already returned to normal. Tasnoova Tahia, a young Bangladeshi instructor, had the earthquake on March 11 on 45th floor of a high-rise apartment in Tokyo. She’s closed her class since then, but it’ll resume in May. Many students look forward to the reunion with this sensible woman. Cooking is my hobby. I sometimes cook even Japanese food such as yakizakana (broiled fish) or onabe (winter cuisine served in a pot). Cooking is one of my duties but fun. My husband and I invite 10 – 25 people twice a month and cook for them. I have to do tons of things but I’ve never thought like, “Oh my god, I don’t want to do it. Why do they come to my house?” Never. Because they tell me that my meals are very good. I forget all the pain. I always wanted to cook when I was a child. I watched what my mother was going to do in the kitchen. I spent time there when I was free. Every time I had something delicious, I asked mom how she made it. She told me her recipes and I wrote them down. 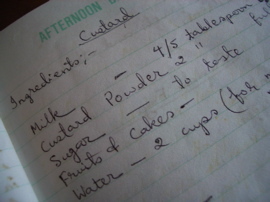 I still have a recipe book which I was using at that time. 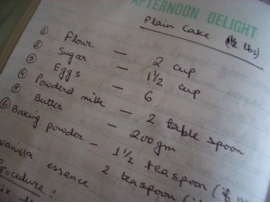 Her original “recipe book” which she used when she was a little girl! We had some maids at home (*According to her, it’s common in Bangladesh). 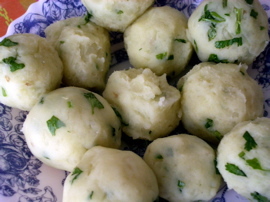 They usually cut ingredients and my mom cooked them. 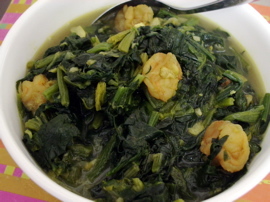 I learned cooking by watching my mom. Then as I entered a high school, I started to do the whole process for myself. I always have been interested in cooking while my friends were interested in comics or cartoons. It’s fun for me to be with Niki’s students. 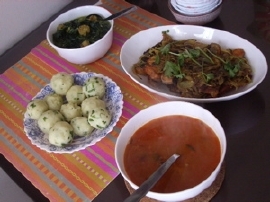 After the class, they send me photos, which are taken when they try my recipes. Learning, trying and sending photos to me… Those make me very happy. Also I got many Japanese friends after starting a class. I meet seven new people every time I open a class. If I have four lessons in a month, I’ll have 28 new students! Maybe 2 to 5 are repeaters, but the rest are all new to my class. That’s a great opportunity to make Japanese friends. I didn’t hesitate to let people in. Because in Bangladesh, inviting people into our houses is very common. We deal with others in very informal ways. We tend to think nothing of talking to strangers. I’ve never scared new people. We can be friends with others in five minutes! Moreover, Japan is very safe. Japanese people are very kind. So I got excited when I heard about Niki’s. I’m a very new teacher, I just joined them last November (2010). 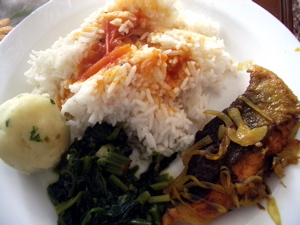 Actually I love cooking. 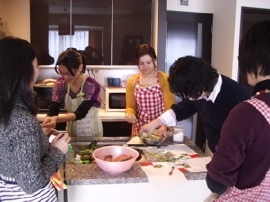 It’s my hobby so I thought, “Why not share my cooking experience or Bangladeshi culture with Japanese people?”. I didn’t have this kind of idea before. I didn’t know that I would be able to do that because I didn’t know any Japanese people. I had Japanese friends but very few. But when I heard about Niki’s, I thought it would be good. I studied MBA at Hitotsubashi, a Japanese national university in Tokyo. They have an MBA class in English. Most of the MBA class students were non-Japanese so I didn’t have much opportunity to meet and make Japanese friends. Before that, I was an English instructor at Berlitz. My former coworkers were non-Japanese. That’s why I never had a chance to meet Japanese people or talk to them. Of course I taught English to Japanese so I talked to them, but it was a “teacher-student relationship”. So I always wondered how I could make Japanese friends. When I was a Hitotsubashi student, I interned at Unilever Japan KK. My Japanese colleagues became friends later. I didn’t talk to them in Japanese because they could speak English. She’s been enjoying teaching her recipes to Japanese. It’s the way for her to make good friends with people in a foreign country. I studied business administration at a Bangladeshi university, then I came here. Originally I was interested in business. I want to open my own restaurant so I wanted to study how businesses are done. MBA is the only way to learn that. And I thought I would be here in Japan for a long time because I got married with a Japan-based Bangladeshi man. So I had to find a job here. In order to do that, I had to get an education in Japan. I’d heard that the Japanese education system is very advanced. So I thought I should have a degree from a Japanese school or study in Japan. But my Japanese skills were not good enough to take classes. I looked for universities which I could take lessons in English. Then I found Hitotsubashi’s MBA school and another univ. in Niigata Prefecture (about 350km away from Tokyo). I didn’t want to be separated from my husband so I chose Hitotsubashi. I think I made a correct choice because I wanted to learn how businesses are done in Japan. In Bangladesh, Japan is a place where everyone wants to go, Japan is a country which everyone wants to know about. Bangladesh and Japan have a good relationship with each other. I learned about Japan a lot from books when I was a kid, such as Mt. Fuji, sakura (cherry blossoms), kimono and green tea. We knew those words when we were kids. I saw some samurai movies like “Seven Samurai” “Bridge Over the River Kwai” and watched a TV drama series called “Oshin“, which was broadcasted in Japan about 30 years ago. It was very popular among us and we were waiting for Oshin to come every Monday. When the drama series was over, many people cried! Japan is a very attractive country, but I’d never imagined living here because there is a language barrier. I originally planned to study abroad, but it didn’t mean studying in Japan. 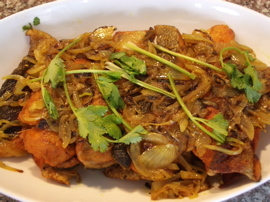 Really yummy Bangladeshi home cuisine!! Japan is a good country, but it’s a little bit hard for Moslem people like us to live in. We never eat outside and buy food at supermarkets. We get food at halal food shops. There are some halal food shops in Tokyo and you can buy even online. So actually it’s not hard for me to live in Japan. Japan is my second home. I’ll be here for a long time. I’ll build a life here with my husband and unborn kids. And to my kids, Japan will be their home. be more attached to Japanese society. Her page on Niki’s Kicthen (Japanese)：Click!